Back in December of 2009, I travelled to Denton, Texas to watch my oldest daughter Paige graduate from the University of North Texas. We had a grand time there, especially on the Denton County Courthouse square, with all the touristy type stores decked out for Christmas. And that used bookstore! You see, Denton, like many small Texas towns, had a opera house on the Square ages ago. This one, like all similar opera houses in Texas I know of, had fallen into disrepair. So it was converted into, at present, a huge bookstore. What a wonderful place to browse in! 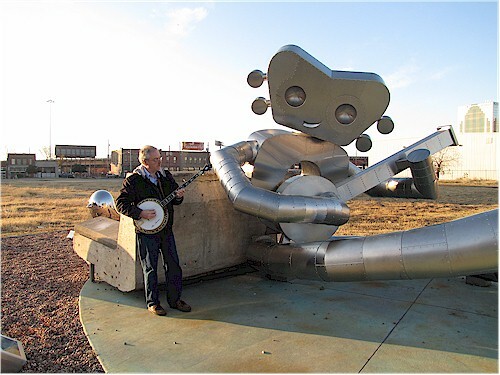 I had also heard that there was a very interesting street sculpture just east of downtown Dallas of a banjo man. Armed with information from the Internet, I set out to find him on the way back, and sure enough, there he sat in the Deep Ellum District at the southwest corner of North Good Latimer and Gaston Avenue. Quite an imposing figure, I have a few photos of him here, along with yours truly picking a number with him. The Deep Ellum district in Dallas was once a famous venue for Blues musicians. It appears its renown has diminished in recent decades, though. And alas, when I went to Google street view just now, the Banjoman is barely seen on the higher-altitude view, but in the street view (seemingly newer as the trees are bigger), it appears that some construction is going on at that corner. Could it be he has been removed? There is another similar ‘tinman’ elsewhere in Deep Ellum, two blocks northwest at Good Latimer and Miranda Street; this fellow appears to be a singer, not a banjo player. Click on these images for a slightly larger photo. This entry was posted in Banjos and Society, History and tagged Banjoman, Dallas, Deep Ellum, Denton, Gaston Avenue, Good Latimer. Bookmark the permalink. I’m a big fan of the Travelling man series of sculptures in Deep Ellum. There are actually three along Good Latimer. The first one is at Elm street and has The Man emerging from the ground, surrounded by birds (you can see this in street view). The second is the Banjo Man and the third is the Man walking with a bird on his hand. The sculptures are still there, and will be for a long time. They are on Street View, though the Banjo Man is hard to see because a train is going by. Oh, and isn’t that Denton Used Bookstore amazing? Great – I was hoping someone close to Dallas would know the answer! Thanks for the details. And I’m glad it is still there; I didn’t realize there was a train going by in the street view. Yes, I could spend a lot of time (and $!) at that bookstore.